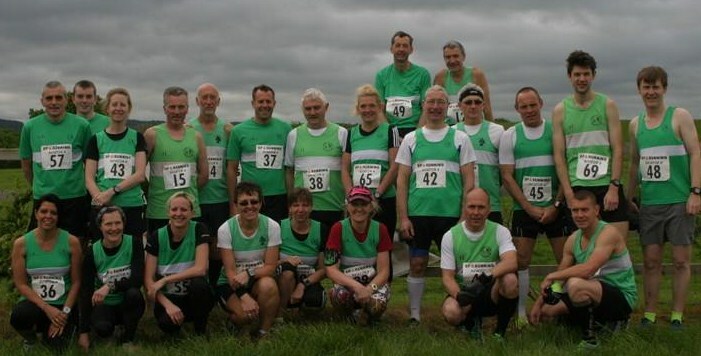 Forest of Dean AC runners had a busy weekend, representing the club in a number of different events. 23 took part in CLC Striders’ Avaitor 4 mile road race and club came away with 6 awards. Peter Woodward was 2nd overall in 22:58: a pb. Age category winners were Carmen Rodriguez SL in 30:29 John Russell MV40 24:22; Stef Francis FV45 32:41; Jacqui Wynds FV55 32:17 and Chris Moore MV60 28:36. Other times were Daren Smith 24:33; Leyton Fleet 24:35; Richard Pegler 24:41; James Dobbing 24:59; Marcus Bennetto 25:39; Richard Powles 25:40; Martin Drew 26:12; Alan Robertson 27:30; Brian Francis 28:26; Roger Morgan 31:24; Graham Bennetto 32:39; Ian James 33:56; Anna Freeman 34:36; Claire Morgan 35:21; Jo Babij 36:14; Vanessa Pegler 36:35 and Bev James 38:44. For the first time since the Championship was reintroduced in 2012, Julian Boon was absent from a nominated race (see later). Down in Bristol, Karen Barnett completed the Bristol 10k in 56:08, a minute faster than 2013, and Louise McKensie in 57:37, her 3rd pb of the week. Graham James joined about 170 others in the Stroud Trail Marathon, his first attempt at the distance. This race includes nearly 3000ft of climbing: Graham finished in 5hrs25mins. Liz Usedon completed the shorter half-marathon course in 2hrs33mins. 2014 Marathon des Sables finisher Simon Dimmer competed in the Porthkerry 5 multiterrain race, finishing 40th out of 235 in 36:58. Janet Dimmer finished 97th in 41:08. Mark Mathews took part in RogueRuns latest race, a 10k-ish trail run starting a Bigsweir, running north and returning on Offa’s Dyke Path. Mark was 6th overall and 4th MV40 in 51:21.